The concept of "declination phase"
Opening angle - yet another launch constraint! This article is an attempt to analyse the flight profiles of all known launches in the 7K-L1 program (a.k.a Zond) in order to find the launch constraints and to see if all missions fit the same pattern of constraints. The analysis is an update and extension of ref (1). Opening angle between the moon's orbit and the transfer orbit. Two launch attempts (that both failed) do not fit the pattern: 22 April 1968 and 20 January 1969. The table below summarizes the data used in this analyses. The source for launch times is Vladimir Agapov and Igor Lissov (2) and the other data have been computed by the authors. The launch time and Age information makes it possible to determine whether or not a particular launch was aimed at the moon or not (see "How to compute the launch time of a lunar probe"). The figure below shows that all launches except Kosmos 146, Kosmos 165 and Zond 4 were aimed at the moon. The two Kosmos launches were attempts at testing basic systems of the L1 system and Kosmos 146 entered a very elliptical orbit (parameters not known) while Kosmos 154 was stranded in low earth orbit. It was probably also intended to go into an elliptical orbit after firing of the Block-D stage. All launches except the 20 January 1969 launch took place at a lunar Age between 20 days and 25 days, a rather narrow "window"!. The Jan '69 launch occurred at Age = 2 days. Another very odd conclusion is that the first Zond attempts were clearly aimed at the Moon, and then, all of a sudden, Soviet mission planners became cautious and launched Zond 4 away from the Moon just to test communications and re-entry techniques. Very strange! The spacecraft arrived at the Moon between Age 23.3-28.3 days, i.e. very near new moon. The sun was therefore behind the moon, so by looping around the moon the Zond crew would have observed the far side of the moon. One can speculate that the Zond spacecraft flew towards the moon and back in the attitude shown in the figure below. Possibly, the choice of near alignment between the sun-Moon and Moon-Earth vector helped simplify the trajectory by minimizing solar gravity perturbations of the flight path. There is an another important parameter that seems to define Zond launch windows, the declination phase. Each month as the moon orbits the earth its declination varies in a near-sinusoidal manner as shown in figure A below. The maximum declination reached each month is not constant and can vary by ten degrees over the course of several years. This is shown in figure B where declination plots for two different months are given. The plots have been aligned in phase and a new variable termed declination phase (DF) has been introduced as a measure of time. because of the cyclic variation in declination each month the maximum northern value of declination is reached when DF=90 degrees and the maximum southern declination is reached when DF=270 degrees regardless of the maximum monthly swing in declination. Declination phase which varies from 0 to 360 degrees serves a a normalized representation of lunar declination and allows the comparison of lunar flights occurring years apart when the the monthly maximum declination values were significantly different. The moon's location may be specified in terms of two variables; age (A) and declination phase (DF). A plot of the moon's motion in the A,DF plane during a typical lunation is shown below. The trajectory of the moon on the A, DF plane is not the same for all lunations. In general, every lunation follows a parallel but different track. If all lunations for several years are plotted then the whole area of the A,DF plane becomes filled. Of the eight launches aimed at the moon six took place when the declination phase of the moon at launch was between 78 degrees and 128 degrees. This means that most Zonds flew towards the moon when it was near its "northern apex" in its orbit around the earth. One can speculate that this choice of trajectory would make it easier to track the mission from northern hemisphere ground stations. But it could also have something to do with the re-entry trajectory definition. During these periods the two conditions that the age should permit viewing the far side of the moon and that the declination of the moon should be high are not fulfilled. It appears that not only were age and declination phase important but also that the Zonds had to be launched at a very restricted time when the parking orbit and the moon's orbit were most nearly co-planar. Let us assume that the moon's orbit is co-planar with the ecliptic. The parking orbit of the Zonds had an inclination of 51.6 degrees. Depending on the launch time the angle between the orbital plane and the ecliptic (opening angle) varies between 51.6+23.5=75.1degrees and 51.6-23.5=28.1 degrees. The figure below shows a plot of the opening angles for Proton launched Soviet lunar missions. All Zond flights are tightly grouped near the minimum opening angle while the Sample-return missions cluster near the maximum. The reason for choosing the minimum opening angle for the Zonds could be that this condition minimized the perturbations to the trajectory caused by the moon. 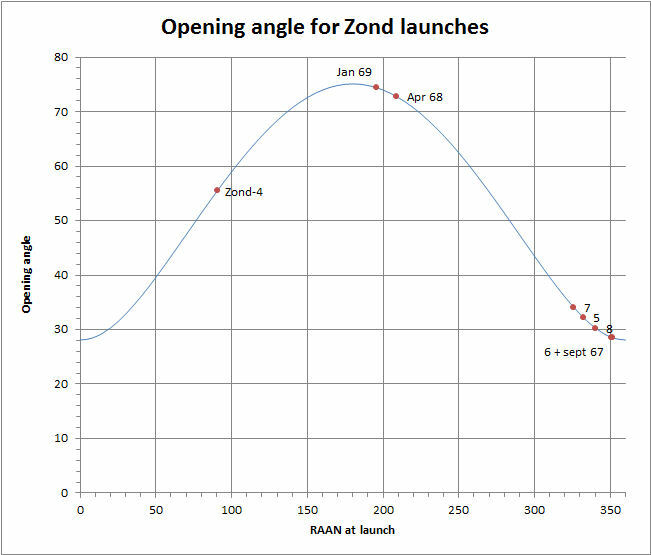 It can be shown that if the opening angle condition is combined with the Age and declination phase conditions there were no Zond launch opportunities between January and August 1969. Two launches stand out as deviating from a pattern. They are the 22 April 1968 launch and the launch on 20 January 1969. The April 1968 launch is near the "main group" in terms of declination phase, but the January 1969 launch leads to an approach from a southern declination of the moon - a violation of the constraints defined by all other Zond missions! Both mission have an opening angle near the maximum possible instead of near the minimum possible (see "Basic data for the analysis")! Any ideas as to why the April 1968 and January 1969 launches deviate so much from the main group are welcome. Clearly the advantageous launch windows had passed by that time. Especially the December 1968 launch window when everyone expected a launch had passed. The launch window opened during 9-14 December (Age=20-25) 1968, well in advance of Apollo 8! Richard S. Flagg, Soviet Lunar Exploration - An Astronomical Perspective, Annex to chapter 2 of "Soviet Space Programs: 1981-1987, Part 2" written by the Congressional Research Service, the Library of Congress, for the Committee on Commerce, Science and Transportation, United States Senate, 1989. pp 363-391. Igor Lissov, e-mail dated 29 Dec 2005 about launch time for the 22 April 1968 flight.